How Many Styles of Leadership Do You Use? Research on Leadership was initially – before 1945 – focused on leadership traits. These physical and personality traits you would be born with. Systematic research of all these traits returned few significant results (The height of an individual was slightly significant, which is good news for Dutch people!). However, 50 years of leadership studies has provided a lot of different typologies and taxonomies, but there is not a clear consensus on effective leadership behaviours. Professor Gary Yukl is an authority on leadership behaviour and in a recent article he provides a consolidated view on leadership behaviours. The result is a taxonomy of 4 categories together providing 15 leadership behaviours. External Behaviour is focused on acquiring the relevant (external) information and on defending the interests of the team/organisation. The question – of course – is when do you apply which type of behaviour. Or, at least, which behaviours are more relevant in specific situations. Unfortunately, there is no consensus about this in research. Personally, I find the situational leadership approach by Hersey and Blanchard quite helpful to make sense of this. First, External behaviour needs to be fairly consistent, although in times of crisis leaders will (need to) shift focus more inwardly (inside the organisation) toward change oriented and tend to become more task-oriented and directive. Second, outside times of real crisis the rule of thumb is that the relative emphasis on either task or relations oriented behaviour will be based on the so-called performance readiness of individuals and groups. Relative unable, insecure and unmotivated people or groups will need task oriented behaviour. However, as soon as performance readiness is improved task behaviour can be reduced and relations behaviour increased. 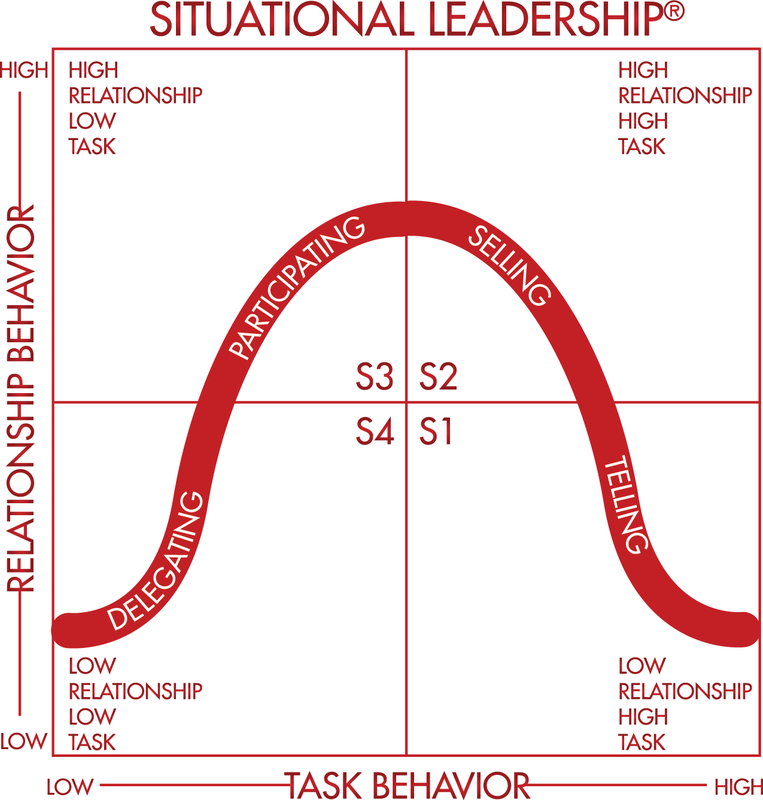 Hersey and Blanchard distinguish between telling leadership (high task – low relationship), selling leadership (high task – high relationship), participating leadership (low task – high relationship, and delegating leadership (low task – low relationship). A practical example of the latter situation is a business manager who has a clear mandate and is coordinated on output (e.g. quarterly results). In the mean time there is no task or relation behaviour. What is interesting is that most leaders have a preference when it comes to telling, selling, participating or delegating. This would be there “native” style which comes rather automatically. Question 1: What is your preferred style? Question 2: Recognising all styles are necessary what is your style flexibility (i.e. can you lead with 1, 2, 3 or all 4 styles?). Often, younger leaders have a lower style flexibility.